The Bradford family unites with the Man family with the marriage of Mary Bradford to George Octavius Man in 1869. Mary was the daughter of Lieutenant General Evelyn Bradford. Two Bradford family genealogies can be viewed: the first found here is very basic while the second found here is more elaborate. 1850 Mary born in Staines and who married George Octavius Man. Ellen the first wife died and on 27 May 1859 EB married a lady by the name of Margaret Clementine Fell in 1859 in Calcutta, India. At some point before 1867 she too died and EB next married a widow Alice Maud Mary Rosamund Wollun on 11 May 1867 at Fort William, Bengal, India. Alice died in June 1871 at Lucknow, Uttar Pradesh, India. They had a daughter, Norah Lillian, who was born on 3 May 1869 probably in India, and she died on 5 May 1898 in Wandsworth. After EB retired from India and settled in England, he cohabited with a married lady by the name of Emma Bennett Bearfield (1847-1913) who became his common law wife. One of the two sons of this union was Ernest Evelyn Bradford (see obituary below). 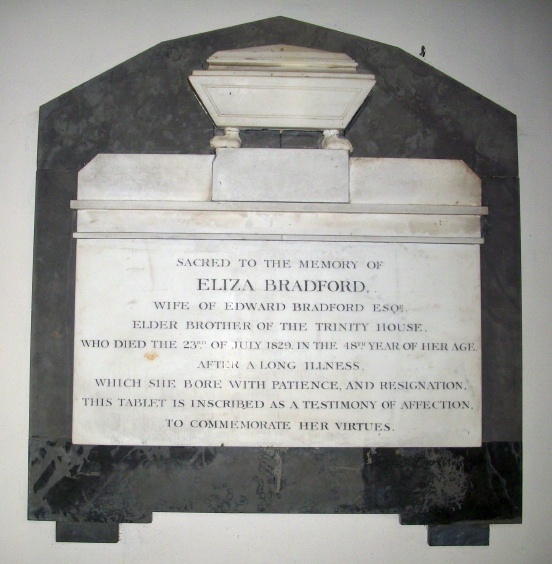 Inscription: Also to the memory of Major General Evelyn Bradford who died January 20th 19– (illegible), aged 84 years. 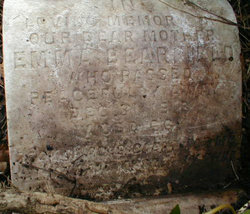 Shares grave with daughter, Norah Lillian Bradford (1869 – 1898). Emma Bennett Bearfield with whom Evelyn co-habited and with whom he had two sons was the wife of Charles Bearfield Jr. Charles and Emma (Bennett) Bearfield had a daughter: Emma Elizabeth Bearfield (1865 – 1865) and two sons: Charles Bearfield III and William Arthur Bearfield (1869 – 1870). 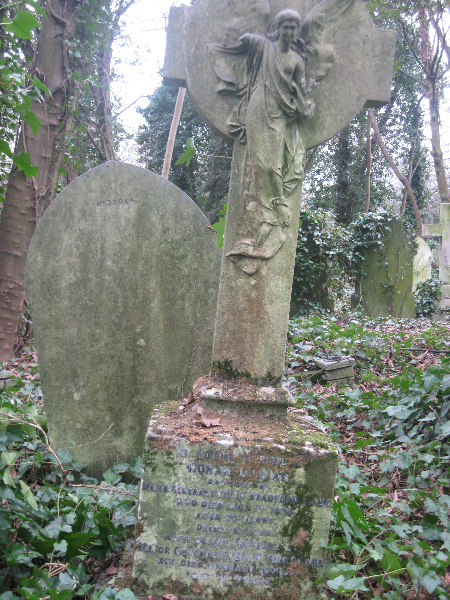 Emma Bennett Bearfield was buried at St. Pancras Cemetery, East Finchley, London (see Find A Grave Memorial# 31227978). Emma’s husband Charles Bearfield was a silversmith and jeweller who had inherited his father’s jewellery business. Unfortunately, he had a not so healthy sideline of receiving stolen goods for which he was convicted and sentenced to five years in prison in 1873. Strangely, both Emma and her husband, Charles Bearfield, were living with Evelyn Bradford in the 1881 census after Charles had been released from prison, along with Emma and Evelyn’s sons: Ernest and William (although he is named Henry in other places). One has to wonder what the household must have been like. Emma is listed as as having a last name Barefield and as Evelyn’s “sister”. Emma had a brother William Bennett. Emma and William’s father was Ernest Bennett who was a professor of classics at Charterhouse School and had no connection to India or the Bradford family, other than his daughter’s. Emma married Charles Bearfield in 1865 and they had three children and the two that survived infancy were living separately from Evelyn/Emma/Charles in the 1881 census, being raised by Emma’s parents and an aunt. Below right John Yardley Bradford by Arthur William Devis in the Uniform of the 21st Bengal Native Infantry with Taj Mahal Beyond (1808) and his memorial left. 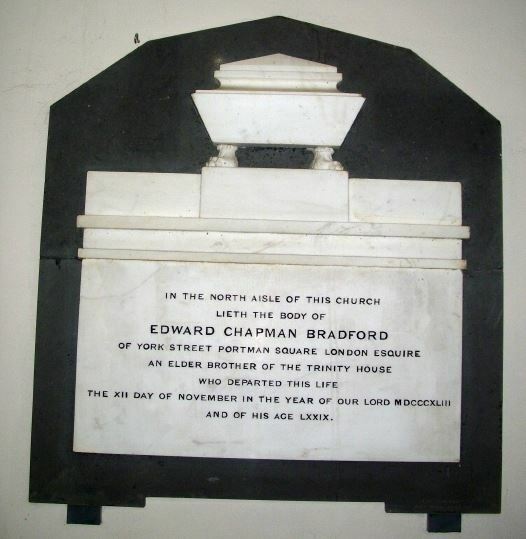 General Sir John Fowler Bradford was born in London on 28 February 1805, a son to the late Captain Edward Chapman Bradford of the Honourable East India Company. On 5 May 1821, Bradford was posted as a Cornet to the 1st Light Cavalry. 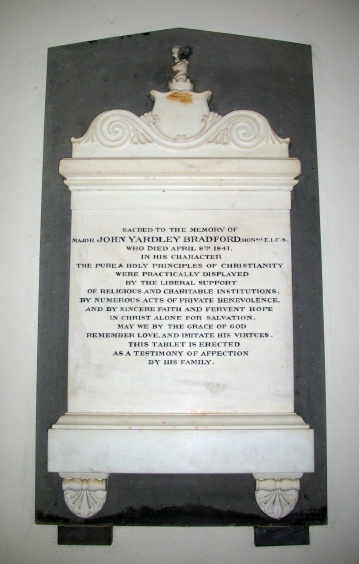 He arrived in India in September of that year, following which he served as Instructor and Quarter Master (6 October 1825-13 March 1832). After a furlough from 26 January 1837-10 May 1840, Bradford returned to India, where he fought in several engagements in the First Afghan War (October 1842-October 1843) leading to the re-occupation of Kabul. He also served in the Gwalior Campaign at the battle of Maharajpoor (December 1843). At the battle of Aliwal, during the First Sikh War (18 December 1845-22 February 1846), Bradford commanded the 1st Light Cavalry in the famous charge with the 16th Lancers. The cavalry broke directly through an enemy square and routed the Sikh army, but at a high price. 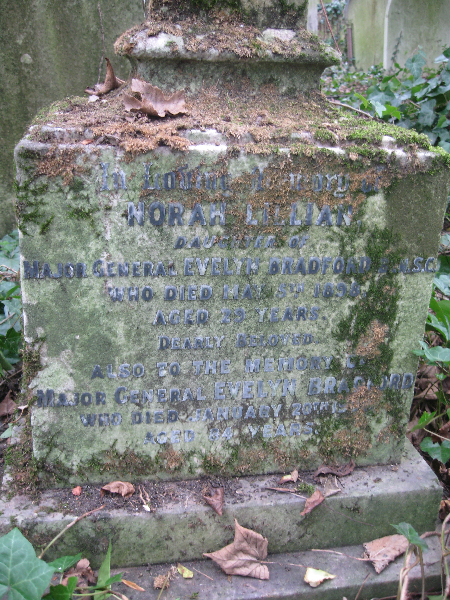 Bradford’s regiment lost 9 men and some 23 horses. For the manner they contended for the glorious prize of victory, the 1st Light Cavalry under the command of Major Bradford received an honourable mention in the Dispatch of Major-General Sir Harry Smith, the Commander-in-Chief. In the Second Sikh War (7 September 1848-14 March 1849) Bradford again distinguished himself in the battles of Chilianwala and Goojerat. He was mentioned ‘with great approbation’ in the Dispatch of Major-General Sir Joseph Thackwell, Commander-in-Chief of the Cavalry Division. For his gallant service in the Sikh Wars, Bradford was appointed a Companion of the Bath on 9 June 1849. On 20 May 1871 he was promoted to Knight Commander of the Bath. He retired from active service on 31 December 1877 with the rank of General. A short obituary of Sir John Fowler Bradford appeared in the Times. His notes and diaries on Indian life can be found at the British Library (Ms Eur D.1057 1842-49, 1854-56). 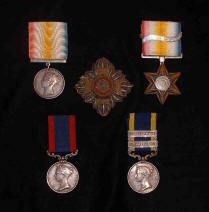 Sutlej Campaign Medal, 18 December 1845-22 February 1846, with reverse exergue for Aliwal 1846 (Lieut. Col. Bradford 1st Light Cavalry); Punjab Campaign Medal, 7 September 1848-14 March 1849, with bars Goojerat, and Chilianwala (Bt. Lieut. Col. J.F. Bradford, 1st Bengal Cavy.). 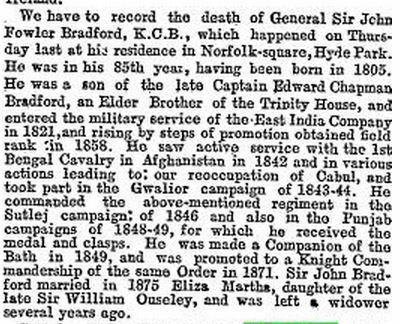 Below obituary of Sir John Bradford In the Times April 15 1889. General Sir John Fowler Bradford died peacefully at home, at 40 Norfolk Square, London, on 11 April 1889. 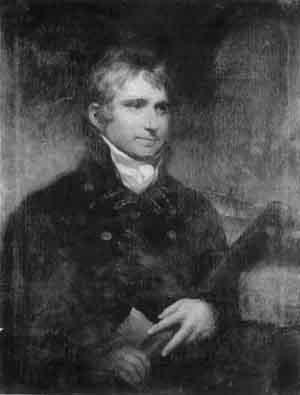 Other marriages made by the Bradford family include that of Harriet Bradford (Mary (Bradford) Man’s great great aunt) to Kenneth Callander and the subsequent marriage of Kenneth and Harriet’s two daughters, Emily and Caroline, to two members of the Hardinge family. In February 1824 John Fowler Bradford (Mary Man’s great uncle) married Eliza Martha Maria Ouseley. Also, Mary Man’s great aunt, Maria Bradford, married Henry Arthur Woodgate. HENRY KERR NESBITT b. (Ireland ?) 1833 (son of Arthur Kerr Nesbitt and father of Henry Edward Nesbitt, Frederick William Nesbitt, Henry Alfred John Kerr Nesbitt, Emily Isabella Nesbitt, Alice Mary Nesbitt, Florence Nesbitt, Bradford Nesbitt, Herbert Nesbitt and Lilian Nesbitt) went to India 1852, d. Southampton England 1878 m.1 1853 Selina Lawlor, b. 1836, d. in childbirth 1854, m.2 Kiddapore 1862 Jane Hannah Outwaite, b. 1845, d. 1870, with issue known 3s 3d m.3 Jounpore 1874 Margaret Helen Bradford, dau of General Evelyn Bradford, with further issue 2s 1d. Perhaps this Nesbit family is connected with EE Nesbitt’s family who rented the Man family home Halstead Hall. The Hardinge family appears here on the Man family web site as a result of a connection through marriage of Mary Bradford to George Octavius Man. At some point in April 1785 or thereabouts Kenneth Callander married Harriet Bradford (Mary (Bradford) Man’s great great aunt) and subsequent to that marriage there were three daughters. The eldest was called Harriet Fordyce Callander. She married Captain William Menzies of the Hon East India Company (whose father was Solicitor to HM Customs in Edinburgh) and they had four children. There are frequent references to the Hardinges in the Menzies family where Hardinges were appointed as Executors and also legatees to various aunts and cousins, etc. 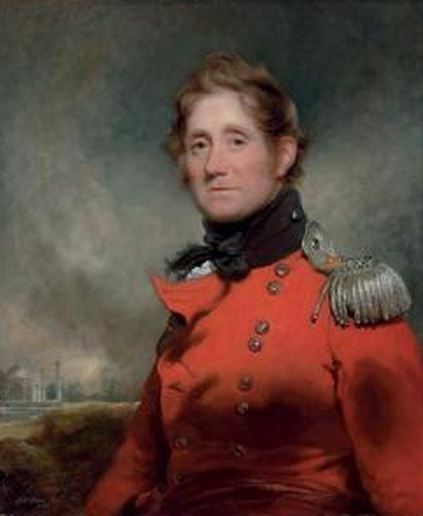 And then on 15 August 1827 her sister – Caroline Johnson Callander – married Charles Hardinge’s younger brother Major-General Richard Hardinge. In Morrice Man’s notes on Mary Bradford’s father (General Evelyn Bradford) he says that General Bradford was aide-de-camp to Lord Hardinge. Some members of the Harding family have achieved public recognition and below we have listed some of these. In [ ] after each name we have described the relationship of the Hardinge listed below to the brothers Charles and Richard Harding (above). Hardinge, Nicholas (1699-1758) [Grandfather]; Hardinge, George (1743-1816) [Uncle], judge and writer; Hardinge, George Nicholas (1781-1808) [Brother], naval officer; Hardinge, Henry, first Viscount Hardinge of Lahore (1785-1856) [Brother], army officer and governor-general of India. Hardinge, Charles Stewart, second Viscount Hardinge of Lahore [Nephew and son of above], politician, was the eldest son of Henry Hardinge, first viscount (1785-1856), and Lady Emily Jane (1789-1865), seventh daughter of Robert Stewart, first marquess of Londonderry, and widow of John James. He was the elder brother of Sir Arthur Edward Hardinge; he was born in London on 12 September 1822. Hardinge, Arthur Edward (1828-1892), [Nephew and brother of above] army officer, born on 2 March 1828, was the second son of Henry Hardinge, first Viscount Hardinge (1785-1856), and Lady Emily Jane (1789-1865), seventh daughter of Robert Stewart, first marquess of Londonderry, and widow of John James. Charles Stewart Hardinge, second Viscount Hardinge, was his elder brother. (1858-1944) [Great Nephew] of , diplomatist and viceroy of India, was born at Dufferin Lodge, Highgate, Middlesex, on 20 June 1858, the second son of Charles Stewart Hardinge, second Viscount Hardinge (1822-1894) of South Park, Penshurst, Kent, and his wife, Lady Lavinia (d. 1864), daughter of George Charles Bingham, third earl of Lucan. Hardinge’s other grandfather, Henry Hardinge, first Viscount Hardinge, had also been a field marshal and from 1844 to 1848 was governor-general of India. Hardinge, Alexander Henry Louis, second Baron Hardinge of Penshurst (1894-1960) [Great great Nephew], private secretary to Edward VIII and George VI, was born on 17 May 1894 at the British embassy, Paris, the younger son of Charles Hardinge, later first Baron Hardinge of Penshurst (1858-1944), diplomatist, and his wife, Winifred Celina Sturt (1868-1914).